This layered taco salad came out of my endless enthusiasm for making pretty much anything for dinner that has the word “taco” in it. Good old regular tacos are one of the best things ever invented, so it stands to reason that anything that riffs off of tacos has a good chance of being a hit at the supper table. Tacos, you never let me down. And so now that it is getting to be the time of year when salads are the order of the day, I wanted to add yet another taco salad to my repertoire of taco deliciousness. This time in a layered version, full of spicy meat, sweet cornbread, shredded cheese and lots of cool and crunchy veggies. Here goes! The only cooking involved is going to be sautéing up some ground beef with taco spices – and if you happen to have leftover barbecue or chicken, shred it up and use that instead! 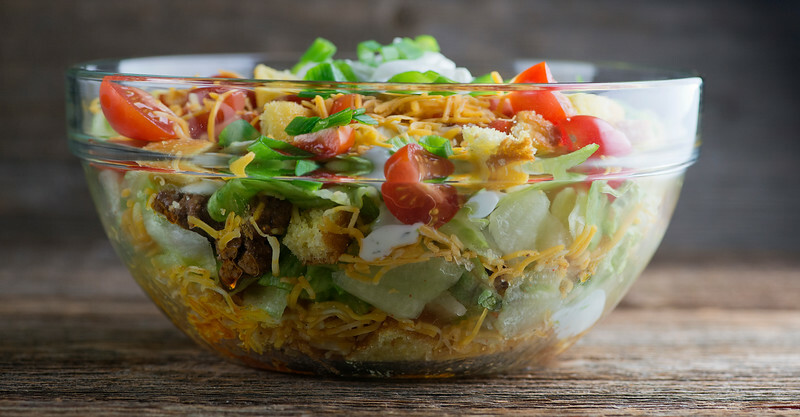 Layered taco salad is wonderfully flexible. The rest of it just involves a little chopping and some artistic putting of things in layers. And eating. Start by cutting up some cornbread into little bite sized chunks. I bought a lovely piece of cornbread at the market, but you can whip up a pan of good old reliable Jiffy cornbread. Or you can go all out and make your own from scratch. Or you can buy a lovely piece at the market. One way or the other, you want 3 cups of cornbread cubes. …and if you don’t have a glass bowl, just use a regular one. You will know in your heart that the layers are there. And the layers are: cornbread, taco meat, cheese, lettuce, ranch dressing, and repeat. Finish with one last layer of cornbread, a handful of cheese and the tomatoes. I like to scatter some scallions on top, and plop a nice spoonful of sour cream on the top of the whole thing. You CAN eat it as soon as you are done, but if you can stand it, let it sit at room temperature for an hour or so. All the flavors will settle into each other and you are basically in Taco Salad Heaven. Do you have a favorite off-beat way to love tacos? Tell me in the comments! In the meantime, here are some wonderful ones for you to take a look at. 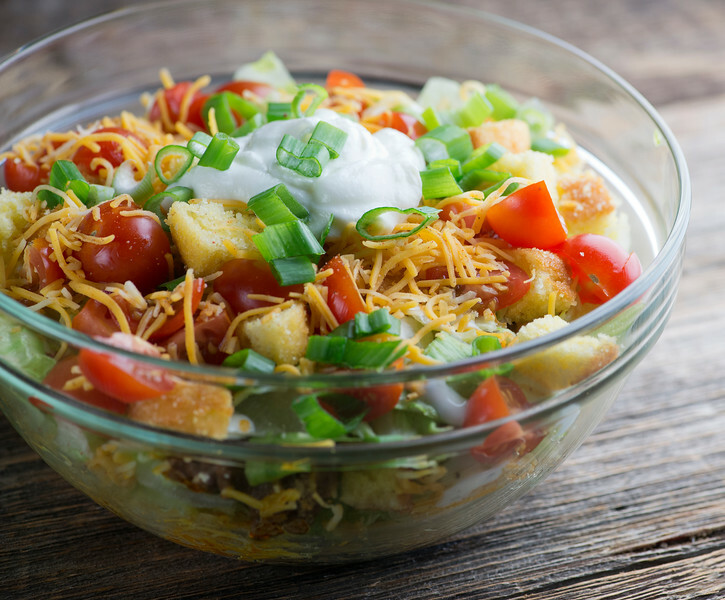 Cornbread, spicy ground beef, cheese and veggies come together for this easy, pretty layered taco salad! Cook ground beef with taco spice mix according to directions. 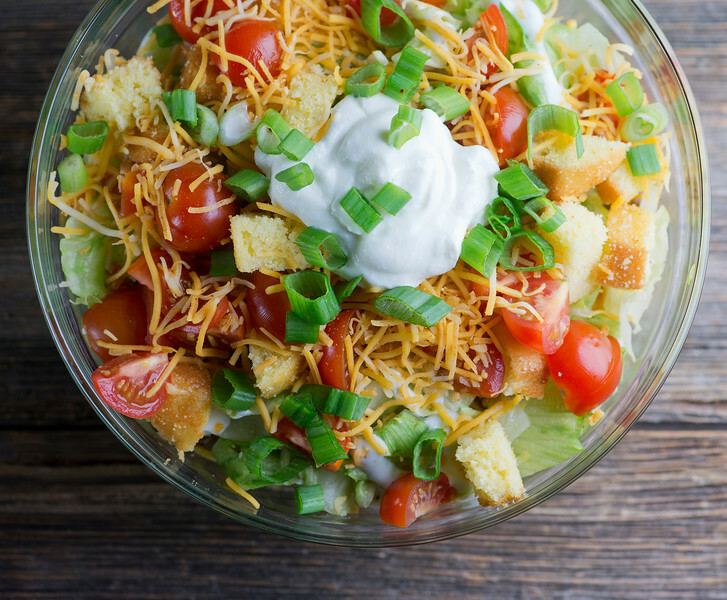 In a large glass bowl, assemble layers as follows: layer of cornbread cubes, topped with a layer ground beef, topped with a layer of cheese, topped with a layer of lettuce, drizzled with some ranch dressing, Repeat. For the final layer, top the salad with the remaining cornbread cubes, the remaining cheese, the tomatoes and a scattering of chopped scallions. Top with sour cream if you like. This can be eaten immediately, or held for a hour at room temperature. You make everything look sooooo good!! Even tacos!!! One question…Doesn’t the cornbread get mushy? It all looks so fresh and beautiful Kate! We have variations of taco salad once a week. OK, that looks awesome! I have a very under-used trifle bowl that this would be perfect for the pre-eating viewing part of the meal. And I think I am going to have to toss those cornbread cubes around in a skillet with a bit of oil so they get a bit crispy. Like a crouton. Or a taco shell. Gotta have the crunch with tacos! Another winner for dinner, Kate! Thanks Theresa – and love the cornbread crouton idea! This sounds delicious. Can’t wait to try it. What did you serve (if anything) with it?